The 7.62x54r has been in military use longer than any other round in the world. Originally designed for the Mosin-Nagant, this round is now mainly used for long distance shooting from firearms like the Russian Dragunov. 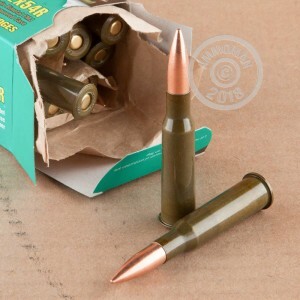 With the availability of ammunition and the ballistic performance of the cartridge, the 7.62x54r is still a widely used round for hunting and target shooting applications. 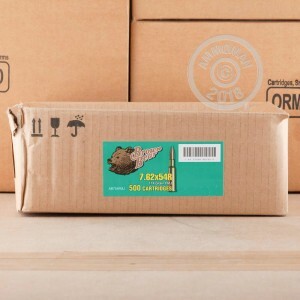 Brown Bear ammo has a reputation for being affordable and rugged. 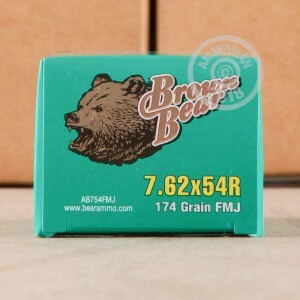 Manufacturing non-corrosive, accurate, and reliable ammunition, Brown Bear gives you just the ammo you need to go plinking and do some range training. Steel cased and berdan primed, these rounds are not re-loadable, but are offered at an attractive price. Grab up these 174 grain, full metal jacket rounds and head out to the range. Don't forget, at AmmoMan.com all orders over $99 will ship for FREE! So stock up on all your calibers and save!